While most of the students at New Mexico State got a well-deserved winter break, the men’s basketball team kept its season rolling. After the Aggies beat New Mexico for the second time of the season, they traveled to play the No. 2 Kansas Jayhawks Dec. 8. The Aggies played a great ballgame in which they were leading for the majority of the game. The Aggies couldn’t quite get the better of the Jayhawks and lost in a heartbreaker 60-63. Head Coach Chris Jans and his team then participated in the Continental Tire Las Vegas Classic Dec. 17-23. 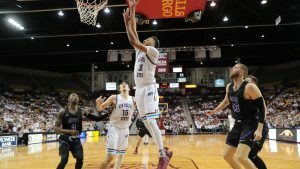 The Aggies had their first two games at the Pan American Center, where they defeated Northern Colorado and California State University, Northridge by scores of 74-62 and 92-57. The Aggies then traveled to Las Vegas to take on the Drake Bulldogs in the third round. The Aggies battled with the Bulldogs for 40 minutes but couldn’t get the better of them and lost another close game 66-63. In the final round of the tournament, the Aggies went up against the Cougars from Washington State and again battled throughout the game. The Aggies edged past Washington State in the end to win 75-72. In the final game before conference play, New Mexico State traveled to Fort Collins, Colorado, to go up against the Colorado State Rams on Dec. 30. The Aggies ended non-conference play on a high note with an 88-68 win over the Rams. The Aggies headed into conference play Jan. 3 with an overall record of 11-3 and their opening opponent was WAC newcomer California Baptist. The Aggies had a slow start against the Lancers, not finding the basket until about 2:30 into the first half. New Mexico State was able to claw its way back into the game in the first half and was only down 32-29 heading into the break. This was just the third time all season that the Aggies were trailing at the break. The other two times were losses to Saint Mary’s and Drake. No matter how much pressure the Aggies put on the Lancers, California Baptist weathered the storm. New Mexico State couldn’t change the narrative and dropped its WAC opener 76-82. The Aggies got a full week’s rest before they welcomed Grand Canyon to the Pan American for their WAC home opener Jan. 10. For the second straight game, the Aggies found themselves down at the break 41-38. The second half was back-and-forth with neither team really gaining an edge over the other. With 1:26 left in regulation, the Aggies were up 74-71 and a couple turnovers from the Aggies led to four quick points for Grand Canyon, which gave the Antelopes the lead 75-74. Grand Canyon was able to get to the foul line to possibly push its lead to three points. After the Antelopes missed the front end of the 1 and 1, NMSU sophomore Johnny McCants grabbed the rebound and took a couple dribbles before launching a shot beyond half-court that stunned the crowd as it was buried through the net as time expired to give the Aggies the win 77-75. Following the madness of the game against Grand Canyon, the Aggies hosted the California State University, Bakersfield Roadrunners on Jan. 12. For a third straight game, the Aggies found themselves trailing at the break. New Mexico State came out strong in the second half and was able to come back and defeat the Roadrunners by a score of 73-62 to push the Aggies’ overall record to 13-4 and a conference record of 2-1. The Aggies next travel to Seattle to play Seattle University on Thursday, Jan. 17, at 6 p.m.